Emerald Ash Borer (EAB), Agrilus Planipennis Fairmaire, is an exotic beetle that was discovered in southeastern Michigan near Detroit, in the summer of 2002. The adult beetles nibble on ash foliage, but cause little damage. The larvae (the immature stage) feed on the inner bark of ash trees, disrupting the tree’s ability to transport water and nutrients. 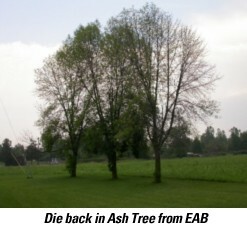 Since its discovery, EAB has killed tens of millions of ash trees in southeastern Michigan alone. Tens of millions more have been lost throughout the rest of the United States. The epidemic has caused regulatory agencies, and the USDA, to enforce quarantines and fines to prevent potentially infested ash trees, logs, or hardwood firewood from moving out of areas where EAB occurs. Adult beetles are generally bright, metallic, emerald green in color. Adults are slender, elongate, and 7.5 to 13.5 mm long. Males are smaller than females and have fine hairs, which the females lack, on the belly side of the thorax. Larvae reach a length of 26 to 32 mm, are white to cream-colored, and flattened on the belly side. EAB generally has a 1-year life cycle. In the Midwest, adult beetles begin emerging in May or early June. Beetle activity peaks between mid-June and early July, and continues into August. Beetles usually live for about 3 weeks, although some have survived for more than 6 weeks in a laboratory. Beetles generally are most active during the day, particularly when it is warm and sunny. Females can mate multiple times. Each female lays approximately 3060 eggs during an average lifespan. Eggs are deposited individually in crevices in the bark. Eggs hatch in 7 to 10 days. After hatching, first instar larvae chew through the bark and into the phloem and cambial region. Larvae feed on phloem for several weeks, creating serpentine (S-shaped) galleries packed with fine sawdust-like frass. Feeding is usually completed in autumn. Pupation begins in late April or May. Newly formed adults normally remain in the bark for 1 to 2 weeks before emerging head-first through a D-shaped exit hole that is 3 to 4 mm in diameter. It is difficult to detect EAB in newly infested trees because they exhibit few, if any, external symptoms. Jagged holes excavated by woodpeckers feeding on the larvae may be the first sign that a tree is infested. D-shaped exit holes left by emerging adult beetles may be seen on branches or the trunk. Bark may split vertically over larval feeding galleries. When the bark is removed from infested trees, the distinct, frass-filled galleries are readily visible. As the population grows in the tree, foliage wilts, branches die, and the tree canopy becomes increasingly thin. Many trees appear to lose about 30 to 50 percent of the canopy after only a few years of infestation. Trees may die after 3 to 4 years of heavy infestation. Epicormic shoots may arise on the trunk or branches of the tree, often at the margin of live and dead tissue. Although stressed trees are initially more attractive to EAB than healthy trees are, in many areas all, or nearly all, ash trees greater than 3 cm in diameter have been attacked. Watch a Fox6 News video on Emerald Ash Borer. It is difficult to detect EAB in newly infested trees because they exhibit few, if any, external symptoms. Jagged holes excavated by woodpeckers feeding on the larvae may be the first sign that a tree is infested. D-shaped exit holes left by emerging adult beetles may be seen on branches or the trunk. Bark may split vertically over larval feeding galleries. We will have our arborist come out to your property to evaluate the tree(s) They will be able to advise on the condition and provide further recommendations upon inspection.